Triobet has some great Sportsbook Giveaways + lots of Free Spins to give out until August 1! 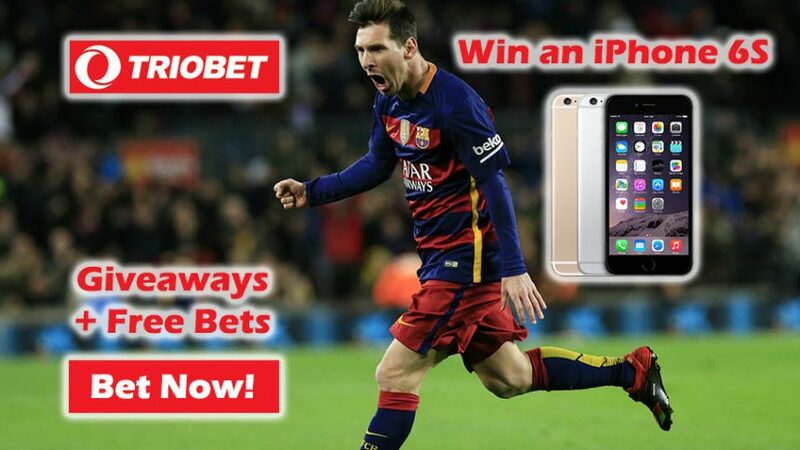 You can win an awesome iPhone 6S and up to €100 Free Bets with Triobet’s Sportsbook Giveaways! Just make a simple €5 combi bet that features 3 (or more) selections and cross your fingers that they win so you advance on the leaderboard. The higher up you climb the greater your chances are of clinching the prizes with the Sportsbook Giveaways! But you have to hurry up! This offer runs until August 1 and then it’s over, so make sure to place your bets now and do it repeatedly to seal a higher place on the leaderboard. On Monday (August 1) the winners will be announced; they’ll receive an iPhone 6S and tons of Free Bets from online sportsbook Triobet. Triobet offers some of the most diverse sports markets in the business and it ranks among the industry heavyweights thanks to its great selection of sports options and regular promotions (there’s a reason why we’ve given them top marks – 9.2/10). Their biggest strength is offering lots of Free Spins, which really helps if you’re thinking of betting with them for the long-term. When you win the iPhone 6S don’t forget to place your next bet with the mobile version of Triobet – it boasts all of the same options that you can find at the desktop version so all the features are just a tap away. The greatest thing about the mobile version is the simplicity of it; you won’t be bombarded with constant reminders that you can claim a Welcome Bonus and the layout is straightforward and user-friendly! Don’t let this opportunity pass you by. Join online sportsbook Triobet now and grab some Sportsbook Giveaways for yourself!